Fujifilm’s decision to get into the digital medium format camera market with the GFX 50S makes a lot of sense. 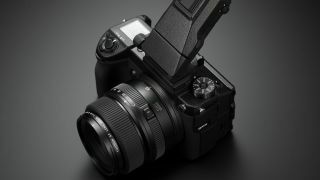 In some ways it's a logical extension to the success it has enjoyed with its premium build X-series mirrorless cameras, although it has a history with medium format stretching back to 1978. That said, the all-new GFX format – of which the 50S is the first iteration – was a bold move on launch and is aimed at those with a more considered approach to image creation – not least those who favour (and need) bags of detail above all else. A high-end proposition with a price tag to match, the camera's medium format sensor, with physical dimensions of 43.8x32.9mm, is 1.7x larger than a full-frame one. As a result the camera gets its own line of G-mount lenses to make the most of the new format, capable of resolving the GFX’s huge 51.4MP resolution (8256x6192 effective pixels). The manufacturer has explained its decision to break with convention by saying that sometimes the world doesn't conveniently fit into a 35mm frame. That said, the GFX 50S is comparable in physical dimensions to a full-frame DSLR. Feeling surprisingly lightweight in the hand despite its chunky looks, this is a mirrorless camera for use on location as well as in the studio. There’s variety of choice when it comes to aspect ratios too: 4:3 ratio at 51.4 megapixels, 3:2 at 45.4MP, 16:9 at 38.3MP, 65:24 at 25.2MP, 5:4 at 48MP, and 38.8MP in the 1:1 format. In other words, photographers can maintain a decent number of pixels at any aspect ratio they choose. The camera further features the compositional convenience of a tilting touchscreen and the option of a fully rotating eye-level viewfinder, the latter of which is electronic and also detachable. We further get a top-plate LCD that handily displays key shooting information and, naturally with this being a pro-grade medium format camera, there is the option to shoot tethered. One might be forgiven for thinking that a medium format camera could be a bit more daunting to use than a DSLR or mirrorless camera, but the reality is that if you’ve used a Fujifilm X-T2 or similar you’ll feel right at home with the GFX 50S. In summation, it appears that Fujifilm’s intention to build on the goodwill afforded its X series, in order to now seek medium format glory, might just have been a gamble that’s paid off.